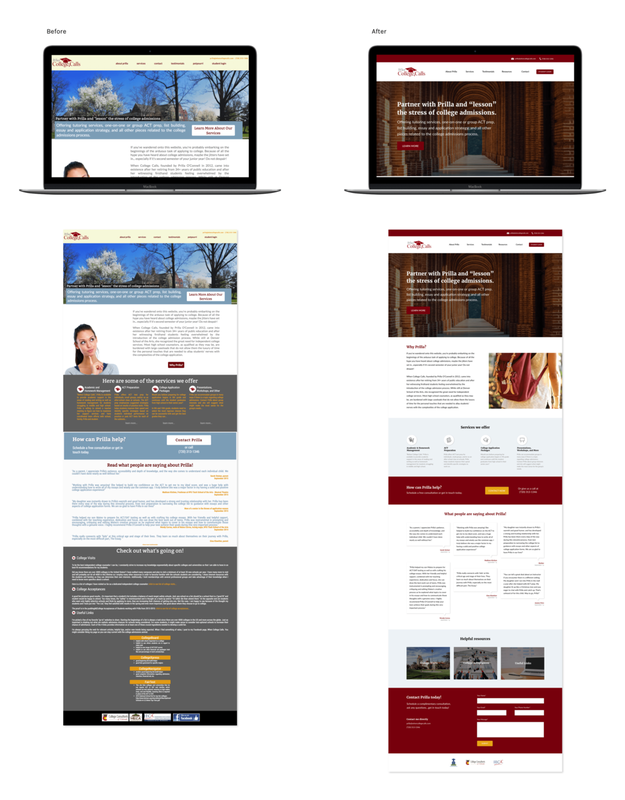 For this project, I worked with a popular SaaS company for educational consultants. This company provides a comprehensive platform for consultants to manage their business and stay organized, allowing them to focus on the most important part of their jobs: their students. They had recently begun shifting gears to generate resources that help consultants grow their businesses online. Part of this new business strategy involved providing consultants with a full range of design services (web, branding, print, digital), which we tentatively named Ad Hoc Creative. 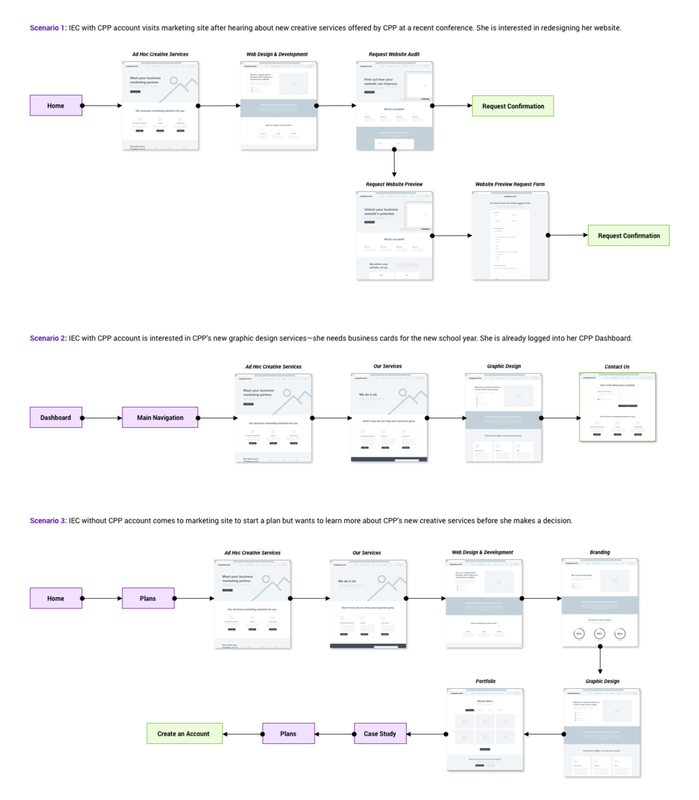 During this project, we developed the backbone of Ad Hoc Creative through extensive research and established a workable user flow for consultants to get started with their design services. The overall success of this SaaS company relies heavily on the success of the independent educational consultant industry. Luckily, from our market research findings, the forecast looks good for the next few years at least. Most IECs specialize in advising a particular niche of students. The market is highly referral-based. 100% turnover business (rely on word-of-mouth for new clients). Busy season starts in late July through January. “Off season” falls around May through late June–early July. Recently, colleges and universities have begun recognizing the IEC industry and actively reaching out to consultants. Because IECs are working in an unpredictable, results-driven industry, their highest priority is making sure their clients are happy. Thus, clients are treated with white glove and highly personalized service. There are only a couple months of “down time” for IECs. Otherwise, they’re booked solid. Consultants sometimes feel like they are part consultant, part therapist when it comes to dealing with parents. Acquire a breadth of knowledge before being able to properly advise families. Having the right personality to deal with parents and teenagers. Salary can vary based on region. In early conversations with IECs about their business marketing strategy and design needs, it’s important to identify their student niche in order to establish their competitive edge. A major selling point for Ad Hoc Creative is saving consultants time when it comes to handling their business’s website and online presence. As the industry as a whole grows, families and institutions (colleges/universities) will come to expect a certain level of professionalism and credibility when researching an IEC online. While running a referral-based business has gotten them this far, IECs may not realize the impact of a solid online presence. We have the opportunity to convince them that there’s even more room for growth. 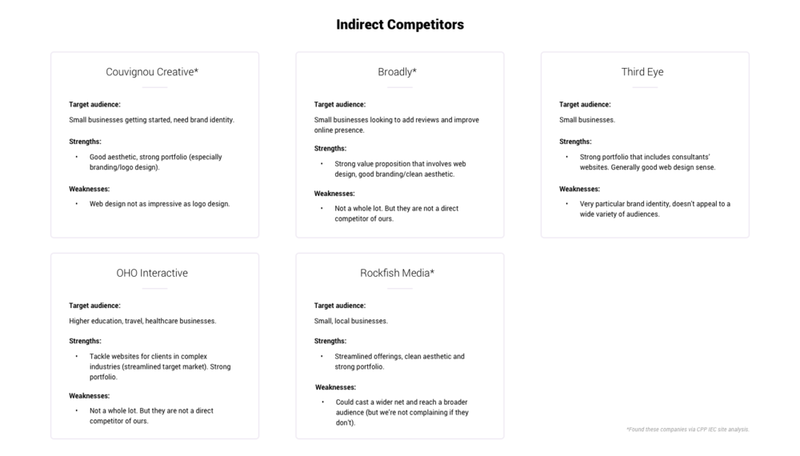 We analyzed design agencies and companies who focus on the consulting industry in general or educational consultants specifically. Hearing directly from IECs who are members of this SaaS platform about their business marketing needs, particularly related to web design, branding, and graphic design. About 50% of survey participants outsourced their website’s design to a freelancer or agency. About 40% of survey participants used a content management system such as WordPress to design their site. 5.6% of survey participants do not have a website. The majority of survey participants use their website to promote and provide families with information about their services. The majority of survey participants (95.6%) have some form of branding—logo, colors, fonts—already established. 65.6% of survey participants have print/digital marketing collateral that they distribute. WHAT DO IECS LIKE ABOUT THEIR WEBSITES? WHAT DO IECS WISH THEY COULD CHANGE ABOUT THEIR WEBSITES? What do IECs use their websites for primarily? Save consultants time and energy when dealing with their websites. Demonstrate our expertise as a business resource for IECs. The survey results showed that there are lots of consultants out there who need help with digital marketing (e.g. SEO) and best practices for websites. A good chunk of IECs already utilize WordPress (or some other website builder) for their websites. This is a great starting point—low cost, low maintenance, and experts who can easily navigate those types of CMS. A complimentary “before and after” type of service may be needed to convince some IECs that, even if your business is run solely by word-of-mouth, a well-maintained and fully functional website further legitimizes your business and reputation. We have the opportunity to further expand IECs’ websites from just being for informational purposes to become e-commerce platforms: allowing families to actually purchase services through IECs’ websites. At the very least, there should be integrations with scheduling apps like Calendly. 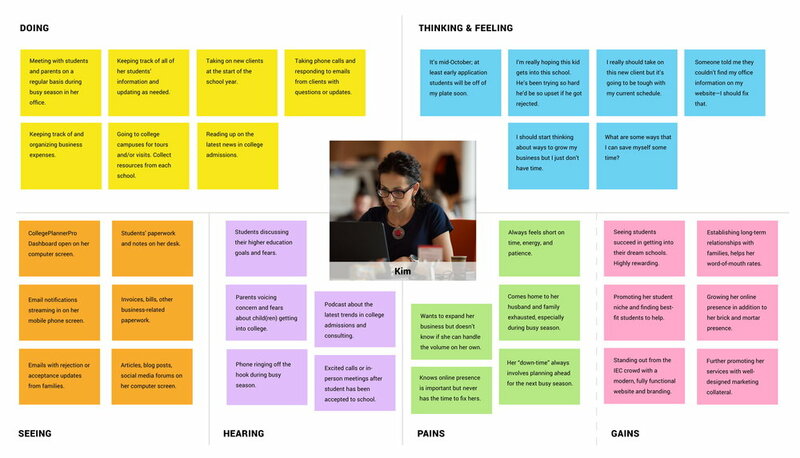 Using our research findings, I developed a persona and subsequent empathy map of an IEC with common goals and pain points as actual IECs dealing with their websites. Once we had a better understanding of users’ needs, we were able to come up with specific features and offerings for IECs. 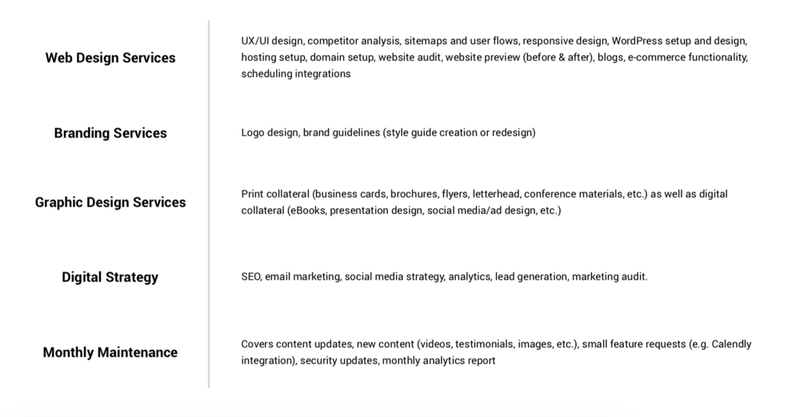 We updated the SaaS company’s marketing website sitemap to include new pages outlining Ad Hoc Creative’s services. Part of Ad Hoc Creative’s new services includes a low-cost, no strings attached before and after preview of an IEC’s current website. The idea is to show IECs proof of how their online presence can improve.